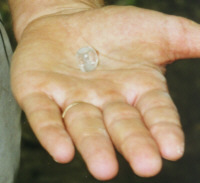 This glass or crystal bead was found with one of the seated burials. The individual may have been wearing it or it may have been placed in the grave at the time of interment. This small ceramic lizard's head was found in a shrine excavated on the shore of the lagoon to the west of the island. It is shown with a drawing done by one of the project artists. 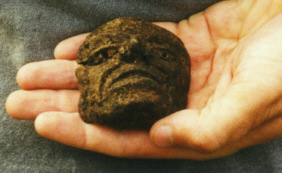 This impressive face, possible of the god Itzamna, is part of an incense burner. It was also found at the shore shrine. Incensers like this were mass produced for use in rituals. We found many fragments of burners which were ritually smashed and their pieces placed on the four sides of the shrine.